At the State Capitol this spring, one significant victory did come out of an otherwise disappointing legislative session for transportation. Lawmakers enacted legislation expected to give cities and counties more flexibility in how they design roads—a big win for safer walking, bicycling, and driving. The new law sets in motion a year-long process that will align the design standards used by local units of government with the design standards used by MnDOT. The MnDOT standards give designers more flexibility to fit the needs of all transportation modes—especially biking, walking, and transit—into street projects despite limited right-of-way (i.e. limited space to work with). Applying one set of flexible design standards to all of the roadways in Minnesota will make our roadways safer and friendlier for all users. Transit for Livable Communities was a part of a small team that successfully worked on this legislation. Senator Schmitt from Red Wing, Representative Kelly from Red Wing, and Senator Dibble from Minneapolis championed the change. Hennepin County also was strongly and publicly supportive. Currently, Minnesota State Aid Rules govern the design of city and county roads that receive state or federal funding. These State Aid rules are different from those used by MnDOT and are less flexible. Unfortunately, State Aid Rules are out-of-step with a growing body of research showing that it is possible to improve safety and efficiency of our roadways by being more flexible with how space is allocated to each mode of transportation. For example, think of a four-lane roadway used by less than 20,000 motor vehicles per day. New research suggests reducing this road to two through-lanes and adding a continuous left turn lane in the center will both improve the safety and efficiency of motorized travel and create more space for bicycles and pedestrians (without the expense of relocating the existing curbs). 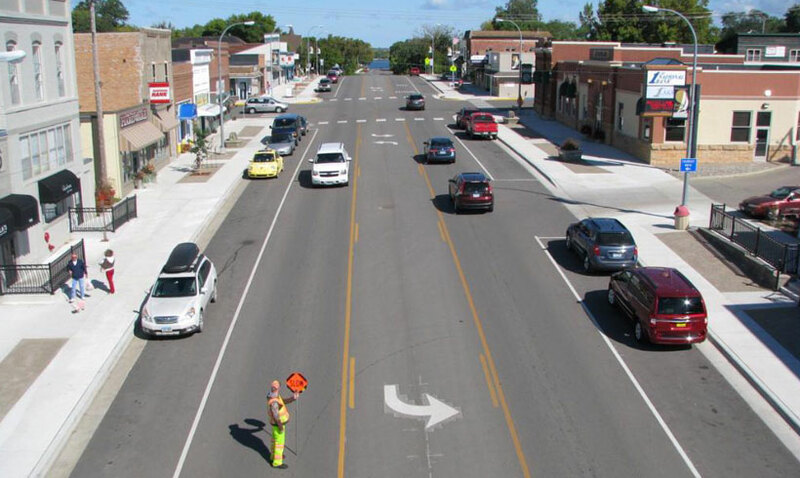 Before & After: This redesign of State Highway 78 through downtown Battle Lake, MN, is an example of a 4-to-3 lane conversion, a treatment shown to improve road safety. Why is flexibility a good thing? Although local governments may want to employ the same flexibility enjoyed by MnDOT, they currently must seek a variance from Minnesota’s State Aid Rules to do so. The variance process is cumbersome. It requires that the local road authority make a formal application to a variance committee and then appear in Saint Paul during one of only four variance committee meetings held each year. This can adversely affect the project schedule— which is frequently tied to funding—causing many local governments to simply forgo applying for a variance that would better balance the needs of motor vehicles with pedestrians, bicyclists, and transit users. Others are deterred by the fact that, if granted, the variance shifts liability from the State to the local government. Still, in 2013 and 2014, there were 52 requests for a variance from State Aid Rule and all were granted. Many of these requests came from agencies wishing to use design flexibility that is currently available to MnDOT in its design guidance for the Trunk Highway System. Cities and counties often request a variance so they can design a road with narrower lanes for driving or parking, for a lower design speed (below the state minimum of 30), and for narrow curve radius. The requests are made to save money, prevent the taking of homes or commercial property, to preserve community character, or to improve access for all road users. Change has been a long time coming. Over the years, members of Transit for Livable Communities have asked us for help fighting road projects where they believed a new design would reduce safety for people walking or bicycling. 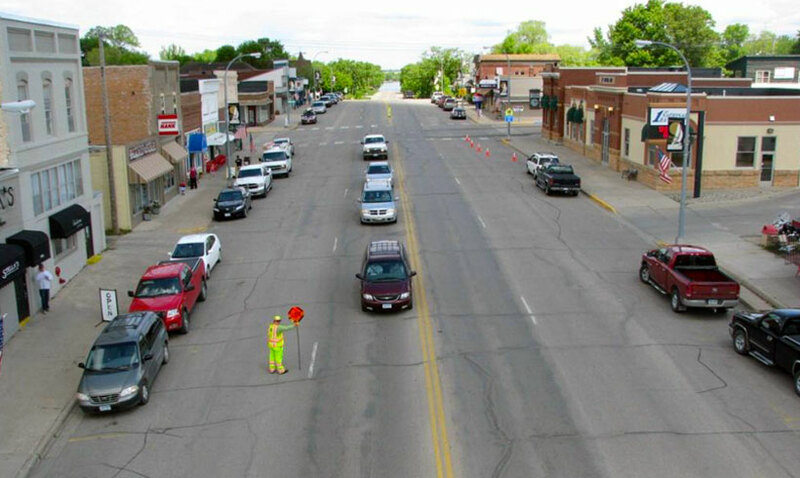 As far back as 2003, TLC attempted to decode the confusing state of road design in our report Sharing the Road, Encouraging Biking and Walking in Minnesota. With the requirements in the new law, however, Transportation Commissioner Charles Zelle will work with city and county engineers to define a single guiding standard that will govern trunk highways, county state-aid highways, and municipal state-aid roads. The new standard is required to be in place by mid-August 2016. 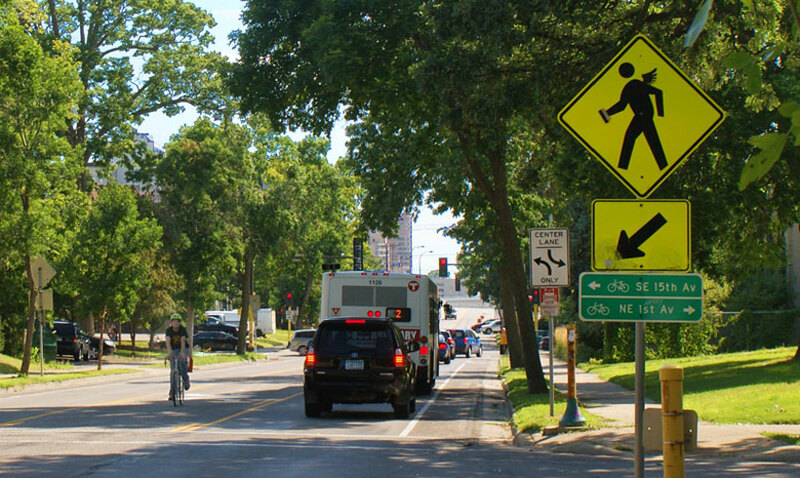 As long as the county and city standard is brought in line with the MnDOT standard—and not the other way around—the new universal standard will help to advance bike and pedestrian safety across the state. Many thanks to staff at the Bike Alliance of Minnesota, the Minneapolis Bicycle Coalition, Avenue Design Partners, Hennepin County, and a number of legislative allies for pushing through this change! TLC and our allied organizations will be closely following the process to develop the single guiding standard and we will keep you informed. Special thanks to Avenue Design Partners for contributing to this blog.